Random Vibration Control provides precise multi-channel control in real time. The device under test is subjected to true random noise with a precisely shaped spectrum with either Gaussian or non-Gaussian amplitude statistics. Up to 12 independently sweeping controlled sine tones may be added to the broadband random signal. Each sine tone has its own sweeping schedule and range. Tones can be turned on and off manually or by a predefined schedule. Up to 12 independent (stationary or sweeping) random narrow-band signals may be superimposed on the broadband random signal. Each narrow-band has its own sweeping schedule and range. They can be turned on and off by a predefined schedule or manually. 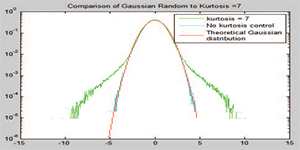 Kurtosis control can provide a more damaging non-Gaussian random control time history. A unique patent pending technology can generate a non-Gaussian control time history while precisely maintaining its spectrum shape. EDM provides the multi-resolution feature that applies the selected resolution in the high-frequency range and 8 times of the resolution in the low-frequency range. The cutoff frequency, which divides the low and high-frequency range, is calculated by the software. 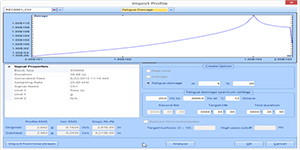 Fatigue Damage Spectrum (FDS) allows users to compare the potential damage caused by different Random and swept Sine profiles. 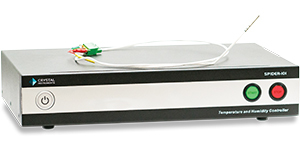 In a similar fashion to Multi-Sine Control, FDS provides a way to reduce testing times by calculating the quickest path to destruction or damage. Swept Sine Vibration Control provides precise multi-channel control in real time. It provides a spectrally pure undistorted sine wave and a control dynamic range of up to 100 dB. As many as 512 channels can be enabled for Control, Notching, Monitoring and time-data recording. The resonance search function determines resonant frequencies from the peaks of a transmissibility signal. Dwell type (Fixed dwell, Tracked dwell, Phase tracked dwell) may be specified manually (with a list of resonance frequencies) or automatically executed after a resonance search is done. Multi-Sine control enables multiple sine tones sweeping simultaneously and ensures that multiple resonant frequencies of the structure can be excited. With multiple sine tone excitation, the required time duration of sine testing can be reduced significantly. This option adds the ability to compute Total Harmonic Distortion (THD) of the control and Input signals. THD plots can be generated while the drive signal either steps through multiple discrete frequencies or sweeps a sine over a predefined range. Sine Oscillator is a diagnostic tool providing manual control of the sine output while the system displays various time signals and frequency spectra. Random excitation can be enabled as a checkup function. When the close-loop option is enabled, the Sine Oscillator is essentially a limited sine controller with augmented manual control functions. Classical Shock Control provides precise, real-time, multi-channel control and analysis of a transient motion in the time domain. Classical pulse shapes include half-sine, haversine, terminal-peak sawtooth, initial-peak saw tooth, triangle, rectangle, and trapezoid. Applicable Test Standards include MIL-STD-810F, MIL-STD-202F, ISO 9568 and IEC 60068 (plus user-defined specifications). 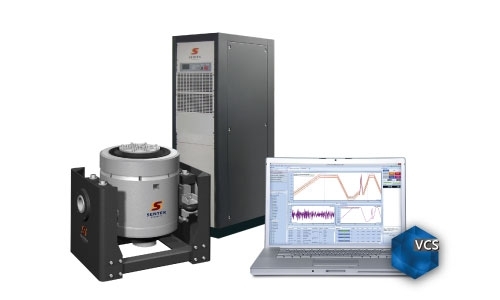 Targeting seismic simulation applications, TTH controls shaker motion to match any user defined transient waveform. Time waveforms can be imported to EDM in various formats. Scaling, editing, digital re-sampling, high-pass or low-pass filtering and compensation will tailor the waveform so that it may be duplicated on a particular shaker. Transient Random control applies a chain of pulses with random nature to the shaker. The target profile power spectrum is defined in a same way as Random control, with the addition of defining transient pulse interval. Applications includes gunfire simulation or road simulation. The SRS synthesis and control package provides the means to control the measured SRS of the DUT to match a target SRS, the Required Response Spectrum (RRS). The necessary drive time history is synthesized from damped-sine or sine-beat wavelets. Damped Sine Parameters include frequency, amplitude, critical damping factor, and delay. Waveforms may be automatically synthesized from a user-specified SRS reference profile. The earthquake testing control package provides controls to meet a target a Required Response Spectrum (RRS). Waveforms are automatically synthesized from a user-specified SRS reference profile using random type of wavelets, uniform or shaped. Alarm and Abort tolerances may be applied to any active channel to provide an extra degree of safety for delicate test articles. Time Waveform Replication (TWR) provides precise, real-time, multi-channel control for long duration waveform duplication. 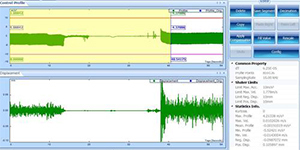 TWR includes the Waveform Editor, a flexible importing and editing tools for long waveform signals. The Recording option records time stream data at the full sample rate on all input channels. Profile Definition: Any existing signal is treated as a profile and is imported and defined as a control. 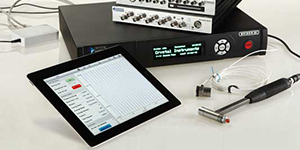 Crystal Instruments EDM App is available for users to run vibration tests from their iPad. Purchasers of the Spider-81 vibration controller are able to download this app for free. 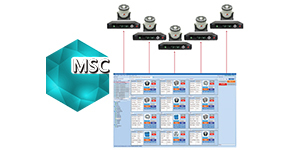 Multi-shaker control (MSC) is a unique feature offered enables users to view and monitor multiple shaker tests from one PC station. Up to 12 controllers can be accessed simultaneously. The EDM Vibration Visualization feature is available in EDM VCS software all test types, including MIMO VCS. 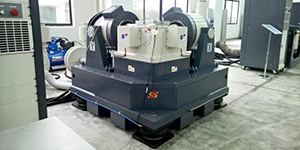 This option provides fast and efficient structural model generation and full 3D visualization of the online vibration pattern on the structure under test. There are many different types of multiple shaker table arrangements based on MIMO testing applications. Multi-Exciter Single-Axis (MESA), is an application in which multiple exciters provide dynamic input to a test item along a single axis. 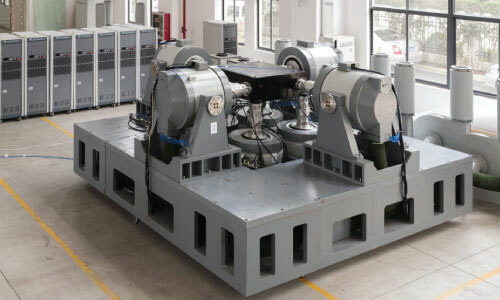 Three axis shaker tables are available for Multiple-Exciter Multiple-Axis (MEMA) test arrangements. MIMO random control is one of the more commonly used multiple shaker control methods, which provides precise control in real time. The device under test is subjected to true random noise with a precisely shaped spectrum with Gaussian amplitude statistics. The recording option records time-stream data at the full sample rate on all input channels. MIMO Sine control is another commonly used multiple shaker control method, it provides precise control in real time. This method controls multiple sine waves with a control dynamic range up to 100 dB. With MIMO Sine control, linear spectrum profiles of Mag, or Mag/Phase are defined and assigned to multiple control channels. The newly added MIMO Shock control is a type of multiple-shaker control testing, which provides precise, real-time, multi-channel control and analysis of classical shock waveforms in the time domain. The MIMO Shock control process is essentially a time-domain waveform replication process that uses an FFT based algorithm for correcting the test system dynamics. MIMO Time Waveform Replication (TWR) is a popular method to use when reproducing field recorded data on a multiple shaker table in the lab. 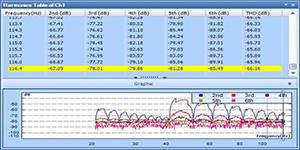 With MIMO TWR control, a time waveform profile containing multiple channels of data can be imported, pre-processed (such as bandpass filtered, etc. ), and selected as a control profile.